Hello Universe! Here is my list (written and refined while meditating/zoning out/drinking in the cosmic bliss of John of God). I also sculpted this in the tradition of Zingermans vision writing (it is strategically sound, documented, and I am sharing it with the world). I Dreamt of Sausage - $$ beyond that which I have spent, interest continuing beyond this time of intense publicity. When I grew up in Washington DC there was a Chinatown. Now there is a Chinatown Gate you can walk by on your way to eat a Fuddruckers before you shop at Urban Outfitters and get a new phone at the AT&T store (not that I am nostalgic). When I was small, and we had a visitor from out of town, our family would head to Chinatown for Sunday morning dim sum. I love dim sum. Whether you call them potstickers or dumplings, they are entrenched in my happy childhood memories. Those long ago Sunday mornings waiters pushed around trolleys filled with towers of pork baked buns, shrimp dumplings, turnip cakes, shrimp toast, sesame balls, sticky rice in a grape leaf, mushroom dumplings, on and on. It was all there to choose from. Waiters came up to the table and lifted lids to show towers of hot food. You would pronounce whether the dish was worthy to joust for room on the table. I vividly remember Chinese New Year. 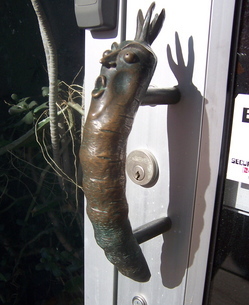 A large, articulated and colorful dragon soared over my head as its long body weaved through the tables to the street. There were drums, there were firecrackers, and there were people shouting and yelling in a unfamiliar language. The clash of the cymbals pulled us out to see the celebration on the street - to see the noise, the smell, the exuberance. Like the scalding tea served at the round tables, (which my olfactory memory tells me now was Pu-erh) it left an indelible mark on my psyche. Dim sum is the traditional breakfast or snack served along tea in China. Some feel the origins harken back to teahouses that lined the Silk Road. It is possible to find restaurants with a dim sum buffet or an a la carte menu. But for me, the experience is indelibly fused with the theater of the trolleys weaving around the dark room. As a seven year old, such power in choosing what I wanted to eat, “Three plates of shrimp dumplings, please,â€ has placed dim sum on its own pinnacle. The first thing my Korean friend shared is that one can purchase dumpling wrappers at the Man Na Oriental Food store on Broadway. She prefers dumpling wrappings with rice gluten added, making them more malleable than just flour and water. 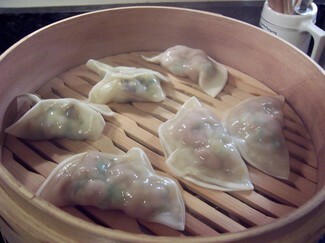 In terms of what to put inside the dumpling, it is a question of whatever you want the final product to taste like. Our recipe called for beef/pork cut small, bean sprouts, spring onions, garlic scapes, tofu, an egg, ginger, toasted sesame oil, and a couple of splashes of soy sauce to taste. She wrung the moisture out of the vegetables so they would not give off too much liquid when cooked. To remove moisture from tofu she gently massaged the tofu through a tea towel. The key is to get the filling to the consistency of a burger and the moisture level of a wet stuffing. After you form the round wrappers around the filling the dumplings are steamed for 5-7 minutes, until the meat is cooked. We did mushrooms only, as wel,l and they were cooked before being formed into dumplings, so the cooking time is shorter. At that point you can eat them, or you can fry them for a crispier texture. I prefer steamed. My favorite sauce for dunking dim sum is rice wine and soy sauce in equal proportions. You can also add red chili pepper flakes, toasted sesame oil, or ginger. I am in the first twenty seconds of the PBS video! Lallalalalaaa! Thanksgiving is a day of rejoicing - of gratitude for a plentiful harvest. At least in my house, there is a bit of a frantic energy around the holiday - “Who is in charge of getting a good turkey?â€ “How many high chairs are we going to need?â€ “Can everyone eat a shrimp appetizer?â€ There are people in our community not having these discussions. Their Thanksgiving dinners will be chosen for them. They do not have the resources to host it themselves. It is these individuals, our neighbors, Food Gatherers works everyday to support. Thanksgiving is a day dedicated to thinking about and eating food. For some their next meal is not a source of excitement or anticipation - it is a nagging pit of potential despair. As Mary Schlitt, Director of Development, tells me “the need is always constant, it is daily.â€ Food Gatherers works to alleviate the daily torment of hunger for our Washtenaw County neighbors - and I was recently able to learn more about this ballast in our food community. 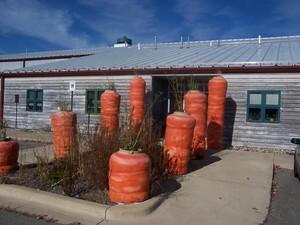 When Food Gatherers moved into their new location in 2003 they choose “to be outrageousâ€ with their mascot - the carrot - says a smiling Mary Schlitt. In front of the very light and bright food warehouse are eight HUGE carrots - a beacon of cheerfulness as one approaches their building on Carrot Way. It is important to be cheerful as one works to change the very sobering food security statistics in our community. There is a 35% rise in demand in aid over last year, Washtenaw County has the highest cost of living in the state, and Michigan is mired in 15.3% unemployment. Food Gatherers is able to receive food from USDA and large corporate donors as Washtenaw County’s food bank. Feeding America is a domestic program that works as a clearinghouse - matching donations and distributing them across the America’s network of food banks. Based on the demographics in Washtenaw County, Food Gatherers is able to receive a certain amount of food. They are charged a nominal fee for shipping. According to the 2009 Food Gatherers’ Food Security Plan in the last four years 200% more food has been purchased to serve the partner agencies as demand has outpaced supply. “Part of the reason we started the garden was because we need some free food,â€ shared Eric. They broke ground on the Gathering Farm in the spring and produced over 21,000 pounds of produce. A portion of that produce went to Scott Rouback, who works in the Community Kitchen, and made over 195 gallons of tomato sauce - “for six weeks all I did was make tomato sauce, I loved it.â€ My 24 jars in the basement are in awe of such an accomplishment. There are several ways you can help. Cold hard cash is always welcome - it is easily convenient, lightweight, and can go exactly where it is needed. Rockin’ for the Hungry, their largest outdoor food drive, is coming up from December 2-6 outside Busch’s on South Main. In addition to donating food you can donate your time. You will meet all sorts of people when you volunteer - some have been donating their time for years, some are students working on their community service hours, there are shelter residents, lawyers, writers, elected representatives, and, even, me. I started volunteering in the Community Kitchen last September. I love being in a commercial kitchen, all of my home appliances have been supersized. The main skillet is 4 feet by 3 feet and holds food for 300 people - as Scott Rouback shared with me, “it is more fun than a snow blower!â€ Every week I looked forward to seeing the clients and the volunteers. However I must add this caveat - donating your time may result in friendships, beware. Food Gatherers “exists to alleviate hunger and eliminate its causes in our community.â€ As I read their mission the hopeful “perfect worldâ€ part of me feels it expresses a clarion call for their own extinction. I would miss my volunteering lunches, the beautiful warehouse, the whimsical carrot, and the amazing people who work there. Though, until that perfect day comes, people are hungry today, and we can help. As I raise a glass in gratitude this Thanksgiving I will think of Food Gatherers - and of my neighbors, who have one fewer meal to worry about because of their work. Here is the link to the article on annarbor.com! This is my first entry under the Farm to Fork title. In my Farm to Fork series I will be visiting local farms around Ann Arbor and sharing what I learn. I was not familiar with the term Farm to Fork until this spring working at the Westside Farmers Market. Despite my original naivetÃ©, when I Google the term today there are over 5 million hits and even an October article in the Economist. I don't know whether or not Americans desire to eat tv dinners and sliders can really make a 765% difference in our food poisoning rates but I do think there is something to knowing where your food comes from. Knowing the animals have rooted in the earth and felt the warm sun on their flesh. Knowing the soil is being cared for and will be able to grow nutrient hungry crops for as long as the farmer desires. I do not want to compare factory farms to sweatshops because I have never been a calf unable to turn around in my own feces nor have I been a 14 year old girl fainting from hunger after a 14 hour work day. I do believe "money talks." Your decision to spend money is a positive feedback loop for whatever you spent your money on - you are voting with your wallet. Common sense. I like voting for businesses that focus on local ingredients, sustainability, and community. We are so lucky to be in Ann Arbor because there are so many great places to choose from. I have been affiliated with Zingermans since 2005 and had visited Cornman Farms with my husband in March to help dig parsnips. I was curious to return and see what the farm looked like before the frost - and to meet the pigs! Cornman Farms is an enterprise started by Chef Alex Young in 2004, 8 miles from the restaurant where the food is served - Zingerman's Roadhouse. The farm also benefits from the collection of compost from both the Roadhouse and Zingerman's Bakehouse. Mark Baerwolf, the farm manager for Roadhouse Chef Alex Young, walked me around the fields. The carrot bed was lacelike, the fronds a vibrant spring green against the dark soil. Mark Baerwolf spoke of Eliot Coleman's work in Maine with the Four Season Farm as his motivation to leave the carrots in the earth during the winter under a blanket of hay. Eliot Coleman and Barbara Damrosch, his wife, have written many books about "gardening the back half of the season," as Mark put it. Given that Michigan has a ample back half, they seem like good people to know about. The tomato and the cucumber beds are now planted with winter rye (a grass) and hairy vetch (a legume). They work in tandem to feed the soil after a summer of hungry plants. As Mark described it the grass is a "nurse crop" for the legume because grass "comes up really quickly and establishes itself" protecting the legume for the time when it will go dormant in the cold. The legume in the spring then feeds nitrogen into the soil, evidenced by the round nodules on its roots. See this video from MSU extension to see the nodules. We walked by the compost pile - resplendent with eggshells from Challah Bread and SourCream Coffee Cake and orange halves from the freshly squeezed orange juice at the Roadhouse. The entire pile steamed gently in the 50 degree weather - mute evidence to the bacterial content inside. They were able to use the hay bales from the Grillin with Food Gatherers as their brown matter to add to all of the fresh additions. You can check out this video of Mark describing the compost. 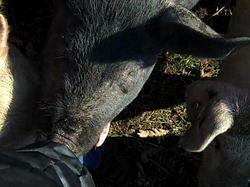 Chef Alex Young and his family started raising hogs this summer as his children's 4-H project. I had never been so close to pigs before, nor have I ever been greeted so enthusiastically! They were very curious and nibbled on the bottom of my coat and my shoes. Some of the pigs have already been slaughtered and are being made into hams, bacon, chops, and loin for happy eating at the Roadhouse. I learned a neutered pig is called a barrow. I felt the hard bristles of their hair along their backs - my only reference point being the elephants I felt in India - elephant hair is longer and less coarse. The pigs have been eating acorns from the oak trees, apples, pig feed, and whey from Zingerman’s Creamery. There is a long tradition of whey from cheese production feeding pigs. The fabled Proscuitto de Parma hams drink the whey leftover from Parmigiano-Reggiano (Parmesan) cheese making and have been for hundreds of years. We spoke of the dirty dozen. The Dirty Dozen is the list of fruits and vegetables that contain higher levels of pesticides: spinach, potatoes, apples, cherries, strawberries, and peaches to name a few. Cornman Farms believe, "if you grow healthy plants they will be able to fend off diseases," and so they have chosen not to use any chemicals. "Really? No chemicals at all? Not even organically certified ones?" I ask. Mark Baerwolf calmly looks at me. "There are some great tasting carrots grown using those different techniques." He pauses and looks over the fields. "We just don't want to use any chemicals." I am humbled with his peace and clarity of purpose. "Okay. Fair enough." The choice not to use chemicals does mean that Cornman Farms uses considerably more intensive labor than other types of farming. For example, instead of spreading an herbicide on the bed of carrots, individual weeds are pulled out by hand. Instead of spraying the potato fields with fungicides, herbicides, and insecticides before, during, and after the potato season individual workers walked through the bushes with buckets of water and insecticide soap. They looked carefully at each plant and pulled off the potato bugs and put them in the buckets, thus leaving the "beneficial lady bugs, hover flies (which are awesome little bugs), and green lace wings." Spraying would have killed all of the bugs, good and bad. We spoke about garlic. I learned most busy kitchens order garlic in big plastic tubs of pre-peeled cloves. "I can talk about garlic for hours," Mark says with a smile. He is supplying hard neck garlic to the kitchen of the Roadhouse. 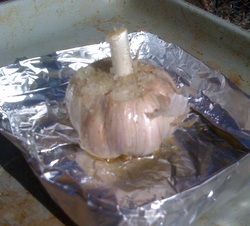 Unlike the tubs of prepped garlic, his fresh garlic has to be peeled and prepped, consuming time and manpower. I was curious to try hard necked garlic. 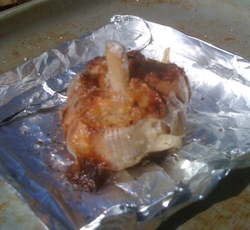 Given my husband is out of town and would not object to a garlic wife, I felt comfortable roasting a whole head and enjoying it for lunch. I quickly learned why they are called hard neck. It was virtually impossible to cut through the neck, so I left it - a little handle for me to use. I poured olive oil, sage, and sea salt over the clove and popped it into the oven for 50 minutes on 350 degrees. sweet, nutty, not metallic or bitter, and buttery smooth. It tasted like the garlic of my dreams. From the dark earth of the farm to my happy fork. 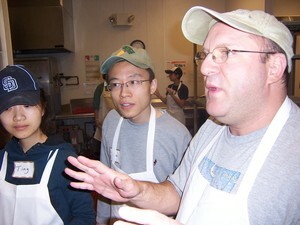 Here is the link to see the article on annarbor.com! The word is Gastronerd (Thank you Katie Garlinghouse).